Director – George Pan Cosmatos, Screenplay – George Pan Cosmatos, Robert Katz & Tom Mankiewicz, Story – George Pan Cosmatos & Robert Katz, Producer – Carlo Ponti, Photography – Ennio Guarnieri, Music – Jerry Goldsmith, Special Effects – Aldo Gasparri & Roberto Pignotti, Model Supervisor/Production Design – Aurielo Crugnola. Production Company – International Cine. Terrorists break into the International Health Organization in Geneva. A beaker containing a deadly pneumonic plague is shattered during a shootout with guards. One of the terrorists escapes infected and gets aboard the Express train from Geneva to Stockholm. 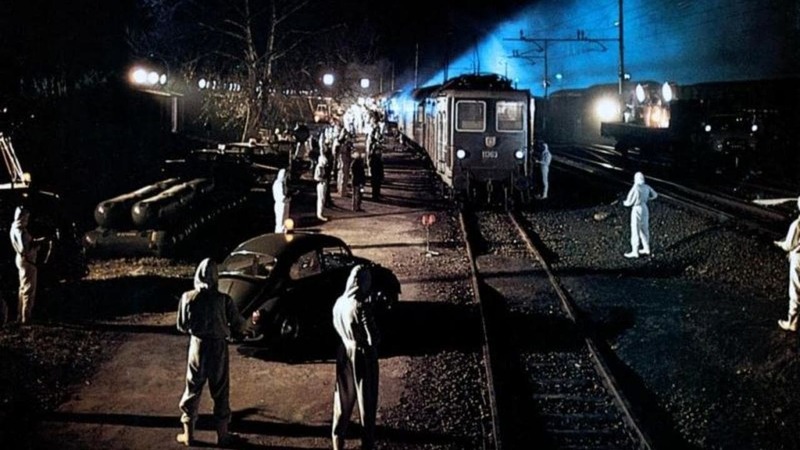 The US military try to have the train stopped but no country in Europe is willing to allow an infected vehicle to stop in their territory. And so the train is sealed up and diverted to Poland via the old Kaslindrliv Bridge, or Cassandra Crossing. As the passengers try to cope with the spreading infection, they realize the military are deliberately misleading them, that the Crossing is not be structurally sound enough to withstand the train crossing it and they are not expected to survive the crossing. The Cassandra Crossing was one of a host of disaster movies that came out in the 1970s following the successes of films like Airport (1970), The Poseidon Adventure (1972) and The Towering Inferno (1974). The virtue of the disaster movie came to be that it arrayed a big star cast and featured some man-made edifice falling apart. It would be too much to expect a 1970s disaster film to be good – at least, The Cassandra Crossing is one that rises to a level of mediocrity. The plague plot is always one that can be milked for good value and the images of the train being quarantined and welded shut are good. However, logic holes fly throughout the script – how can a description be circulated of a terrorist nobody has seen, for instance? Or how coincidental it is that everyone bar the principles becomes infected, considering the amount of time more than anybody else that Richard Harris and Sophia Loren spend handling the infected bodies. Nevertheless, the story retains a proper perspective, never allowing the supporting character soap operatics to get too far out of place. The Cassandra Crossing is certainly a more substantial and less melodramatic than a number of other disaster films of the same era were. Among the requisite big-name star lineup, Richard Harris plays with his tongue in his cheek. Even more amusing is the arch reading given by Ava Gardner, swaggering past armed guards with comments as to how pleased her munitions manufacturer husband will be that they are using his machine-guns. It is also rather amusing to see a young Martin Sheen cast as Ava Gardner’s toy-boy. O.J. Simpson even turns up as an undercover FBI agent. Director George Pan Cosmatos later went on to make the likes of Rambo: First Blood Part II (1985), Rambo III (1988) and Tombstone (1993). Cosmatos’s other films of genre note are Of Unknown Origin (1983), featuring Peter Weller against an intelligent rat; the underrated Sylvester Stallone action/serial killer movie Cobra (1986); and the monster film Leviathan (1989). Cosmatos is an adequate journeyman director. Here he maintains some mildly suspenseful scenes, like the helicopter rendezvous and Martin Sheen’s climb along the roof of the train, although both these scenes are considerably let down by shoddy rear projection and model work.